As you leave Cemaes take the second turning and follow the road to Llanfechell. This village is as pretty as a Welsh village can ever be. Tiny cottages, the only shop and the Cefn Glas pub huddle around the square. The church of St Mechell, parts of which date back to the 12th century, and surrounded by a shrub-filled graveyard, shines bright under its white wash, and the war memorial, a clock tower topped by a leaning soldier, stands in the very heart of the village. Nineteen young men, and where they were lost during both the world wars are remembered here, including three brothers whose family home lies just outside the village. Their walled garden is opened to the public occasionally. Do they stroll with the visitors and admire the neat vegetable plots and carefully hoed rows. Also remembered in a fatal night flying accident was Flight Commander Owen Vincent Thomas. All seems perfect here in the village at first sight until you look a little more closely. The church tower has been plastered up to stop the bells disturbing the sleep of some local eccentric. The pub is up 'to let', and the shop struggles to keep open. Walk behind the memorial and you'll see it has not been well maintained. The inscription on the memorial states that when your sons question the war you will be able to say that the stones carry the message of sacrifice by the brave who fell for freedom, for their King and country. Is the message heard? Did you see the T.V. film made in the village square? lines. Illusion settled on the town. the lane, Robert Lindsey fluttered female hearts. chimed nine. A shot rang out. their memories for another day of let's pretend. For that is all it was. of paint upon the door. clock faces are left to tell the time. 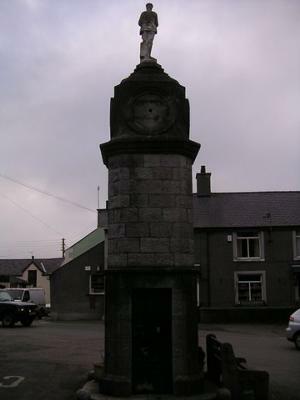 Maybe I am mistaken but I am sure I recollect that last time I was in Llanfechell there were flowers placed around the memorial. Albeit only plastic (for which I was very sad) they showed that at least someone local remembered and was bothered to do something about honouring the sad and terrible loss suffered by almost every family in Britain from 1914 to 1918 - and beyond. I always make a point of taking my grandchildren to read the village memorials whenever we see them. It is so important that they have an appreciation of the courage of their ancestors - and are made aware of how lucky we all are now to live in peace. Return to Anglesey Poets And Artists.